Clifton Lumley was killed while on duty at Grange Hill High School last Friday. (Jamaica Observer) As Grange Hill High School tries to come to grips with the stabbing death of their beloved security guard, 44-year-old Clifton Lumley, school principal Errol Stewart has revealed that discussions are already in train for the school to honour his memory inlight of his sterling contribution to the institution. “We will be finding ways to honour Mr Lumley, and I want to say that whichever way we are going to honour him, it will not only be his name, but his position; [the role he played at the school] would have to be a part of it to let others to come know that there is no doubt in our minds of his contribution to Grange Hill High School,” Stewart told the Jamaica Observer West. Lumley’s untimely death on the weekend has plunged the Westmoreland-based school in a state of shock and mourning. The well-respected security guard was stabbed on the school’s compound last Friday. 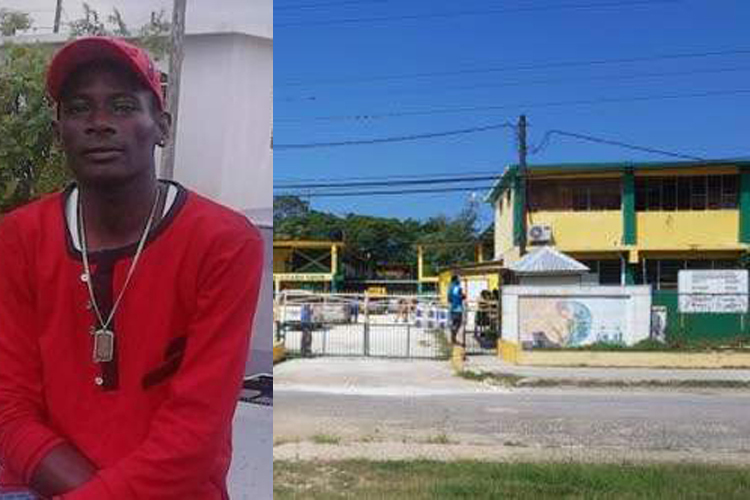 A 17-year-old Grange Hill High male student, who is believed to be connected to the incident, has since been taken into custody by the police. Reports are that at around 2:45 pm on Friday, two young men attacked the security guard at his post near the entrance to the school. It’s understood that one of the men used a stick to beat Lumley, and while he struggled to hold unto the stick, he was stabbed in the right upper body by the other young man, resulting in the puncture of one of his lungs. The security guard, who celebrated his birthday two weeks ago, was taken to hospital where he underwent surgery. He died the following day. The Observer West was told that the student who is allegedly involved in the incident, had been on suspension from school in connection with an unrelated matter. It is not clear what sparked the incident, but our news team was told that sometime before the vicious attack, the accused men were seen on the school compound, and the police were called in. “The police came just before the incident, because we would have called the police. The fact that they [accused attackers] were on the compound, they [police] came, and they [accused men] went off the compound. But not long after the police left, they came back,” Stewart disclosed. He said the guard, who was employed to Alpha Security Company has been based at the school for the past five years, stressing that “the school had fallen in love with the quality individual he was and insisted that he remain with the school”. “He was more than our security guard, he was our utility man. He was a valued member of the school family and was always willing to go the extra mile. He was our jack of all trades,” said the grieving principal. Chairman of the school board Ralph Williams said Lumley’s death came as a shock to him. “It came as a shock, especially when you know that the security was a decent, loving, law-abiding person, who goes out of his way to help others, whether it be staff or students,” he noted. Stewart said in light of the notion that cellular phones played a part in coordinating the attack against the security guard, the school will step up its vigilance to detect the instruments and also intensify punitive actions against students caught sneaking them into the institution. “We are convinced that the cellular phones played a major part. Based on information on the ground, the coordination was done by cellular phones …and we are going to see how best we can deal with that,” he argued. He said an emergency board meeting will be held at the school tomorrow where a number of issues, including security will be discussed.